Computers, whether they are new or old, all seem to slow down, have a lot of errors and crash with increasing frequency the more you use them. What makes these issues difficult is that there could be any number of reasons for the slow-downs, errors and crashes. So how do you repair these issues if you don't even know where to start? The best way right now is software built to do just that--software that looks at a variety of different items on your computer and then repairs any problems it encounters. System Mechanic from iolo Technologies is one such program. When you first start System Mechanic, it will run a diagnostic on your computer to find any current problems and potential problems. It will look at everything ranging from your computer's registry to how files are allocated on the hard drive to boosting Internet speed and more. One common area that needs repair with a computer is its start-up time. A hidden reason for a slow start-up time is that there is a lot of software that is starting up at the same time Windows is. The worst part of this is that you probably don't even know it is doing it. System Mechanic, as part of its feature-set, will look at which programs are starting at the same time as Windows. It will then show you what these programs are, what function they are performing and if those functions are important or not. From there you can decide which programs to keep at start-up and which to remove. Removing unneeded programs at start-up will significantly increase start-up time. Another issue is general computer slowness or sluggishness during the course of the day. This can be caused by a variety of factors. Common ones tend to be orphan files, registry errors and a fragmented hard drive. Orphan files are files on your computer that are "left over" from software you may have uninstalled a long time ago. Yet those files are still sitting there, taking up space. System Mechanic finds and removes those files. The registry is much the same way. Every time you install software, it makes a change in your computer's registry. The registry is where Windows goes to see how to specifically execute programs. When you uninstall software, many times it doesn't remove the information from the registry, forcing Windows to dig through all of this old junk before it finds what it is looking for. Over time, this can create massive slowdowns. System Mechanic, much like it does with orphan files, will find and remove old entries. The other common issue is with a fragmented drive. As you install and uninstall software, remove old files, add new files and basically use your computer, the information on your hard drive moves around. Over time this can become "fragmented." Files that belong near each other move apart. Huge gaps between data can form. By "defragmenting" your hard drive, you can get these files to move back together again, so that Windows can access them that much faster. By running System Mechanic and fixing all of the above, you will also find that your computer will have less errors in general. All of those same problems that cause system slowdowns and slow boot times are also frequently the cause of errors in computers in general. So running System Mechanic or similar PC repair software on a regular basis should keep your computer running well for a long time. 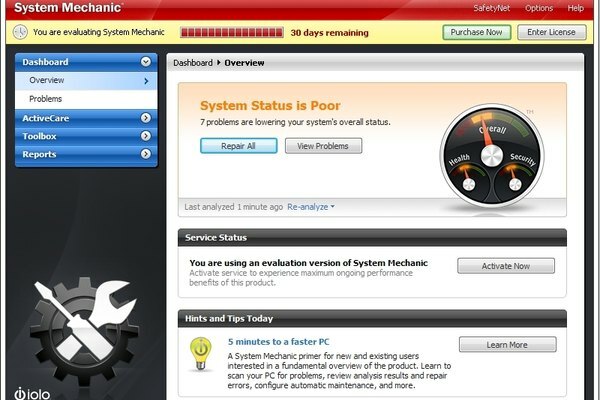 System Mechanic is $39.95 after a free 30-day trial.